Hannah Kent’s 2013 international bestseller Burial Rites took the world by storm, and was translated into 28 languages. It was a hard act to follow, but so far, the reviews for Kent’s eagerly anticipated second novel, The Good People, are cementing her reputation as one of Australia’s best contemporary authors. However, not everyone is raving. In a first for sub-urban, we present our two conflicting opinions: Carmen loved the book, but Helen struggled throughout the novel, and it was an achievement to make it to the last page. We’d love to know which camp you’re in, and why! This haunting story, based on a true event, takes place in 1825 in the south west of Ireland, in a valley beside the Flesk river, near Killarney. In a damp and dreary village, where the rain rarely stops, the locals go about their daily routines and rituals with a dependence on each other, on their Catholic God, and on the ‘good people’, which is the term used to describe the powerful presence of the fairies. In a time and place where education was limited and poverty was rife, traditional folklore was used to help understand and explain life’s tragedies – like death, disability and illness. The three central figures are female: Nora Leahy is a newly widowed grandmother who is left as the sole carer for Michael, her 4-year-old grandson who can neither speak nor walk. Ashamed, she hides him away from the other villagers, except for her closest neighbour. Mary is the teenage hired help, brought to the house to help care for Michael. Loving, patient and protective, she develops a strong attachment to Michael, despite his inability to speak. And thirdly, there is Nance, the local healer and wise woman, who is relied upon by the locals when it comes to childbirth, funeral mourning, and healing the sick. With her special knowledge of herbs and fairy rituals, Nora decides to approach Nance about Michael. There has been whispering at the well, overheard by Mary, claiming that Michael is actually a changeling – a fairy child, who has been left in place of the real child Michael. After failed attempts to engage the priest and the doctor to help Michael, Nora becomes increasingly convinced that Michael is in fact a fairy, and is filled with hope when Nance claims that she can “put the fairy out of the child”. From here, the story takes on a darker purpose. Hannah Kent’s writing is superb – rich and descriptive, with sentences that are beautifully crafted. 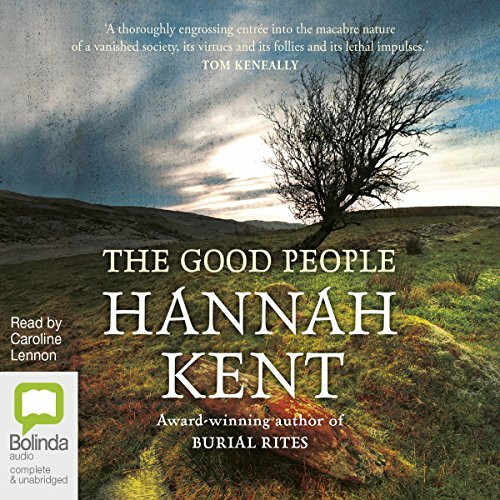 Just like Burial Rites, The Good People is haunting and atmospheric, and Kent paints a vivid picture of the poverty-stricken village and its inhabitants. It’s very easy to imagine the cast of characters and the dramatic setting; in fact, it’s almost as though the scene is playing out on a movie screen in front of you. As you’d expect of Hannah Kent, her sharp observations and skilful research means that she has perfectly captured the essence and the language of rural Irish people. Over the past 15 years, I’ve spent many weeks in a small Irish village in the north west, where my in-laws live, and many of the phrases and colloquial expressions from the novel were familiar to me. I know this gives me a different perspective on the novel, and I’m sure it contributes to my love of the book. But importantly, it gave the book such substance and authenticity. Before I started reading, I’d heard some negative reviews from friends who are avid readers, so I was cautious when I started out. The main criticism is the slow pace of the novel, and the claim that “nothing much happens”. I do agree that the story moves slowly, but for me, this reflects the slow pace of village life. Maybe if the story wasn’t so beautifully written, the meandering pace would be a greater deterrent. The gradual unravelling of the story also provides time for deep character development, and even though I didn’t agree with the actions of Nora and Nance, I definitely felt empathy and understanding for their situation, given their background and their circumstances. I think this is such a gift for a writer to be able to give to her readers. Personally, I found the superstition and belief in fairies to be quaint but intriguing, and I loved the way that Hannah Kent managed to normalise this belief in fairies: it wasn’t just the view of one crazy woman, but rather an accepted belief system for lesser educated, rural people. Furthermore, I found the final section to be particularly powerful in the way that Kent juxtaposed these beliefs with the views of the Dubliners and city folk, who were blatantly dismissive of ‘the good people’. I also think the blend of paganism and Catholicism is really interesting in this novel – that the two can co-exist and people can be so intrinsically committed to both belief systems. There was a lot of anticipation following the success of Hannah Kent’s Burial Rites – a book that I found a real page turner. Although very detailed (which I now know is Hannah’s style, probably due to the fact that her research is so thorough) it managed to keep me intrigued until the very end. I appreciated her beautiful writing, and after meeting her at the MWF earlier this year, it was no surprise that she would produce such an intelligent read. When I began The Good People, I was deflated and quite disappointed from the first fifty pages. I started to think, Was the marketing behind ‘The Good People’ first class? Managing to get this book on the best sellers list so quickly. Perhaps this novel is just too intelligent and I didn’t get it? Would this novel be so successful if it had been published before Burial Rites, and didn’t ride on the earlier success of its author? Although consistently rating well on Good Reads and still making it in the best sellers list in most major bookstores, I am unashamedly happy to call that I thought this book was boring. Sorry Hannah. The pace was excruciatingly slow. I felt that nothing happened until the last fifty pages which was so frustrating. The village life depicted in the early nineteenth century was described down to the most minute detail. The mood was dark and exhausting. Had Hannah Kent not been the author, and if my book club hadn’t chosen this book, I would have given up half way through – and for those who know me, this is not something I usually do. I am not superstitious, which probably explains why I found this such a difficult and unsettling read. This book focused entirely on the madness of folklore and fable and how it blurs with reality. Although based on a true story, I found myself getting so angry at the ignorance and desperation of the village folk, who relied so heavily on ‘the fairies’ to manage grief and illness. Especially as it affected children, the young, barren wombs and stillborn children. I have tried to appreciate this novel on a spiritual level, and I can only come up with the idea that in life, it is powerful and reassuring to believe that you are being guided and supported by some ‘greater being.’ Especially when life throws some spanners at you. Whether that ‘greater being’ is The Fairies, God or for me it’s my people, my village, my family, my friends. Who am I to judge on what gets people through the tough times?........ I must go now as my five-year-old has just lost his first tooth, and I need to become the tooth fairy tonight.